The city unveiled a new bike route from the Kosciuszko Bridge to the larger bike network. Later this year, the state Department of Transportation will open the new Brooklyn-bound span of the bridge, which will include a 20-foot-wide path for cyclists and pedestrians heading in each direction. And the state is working with the city to safely connect that pathway with the larger bike network once cyclists get off the bridge in Greenpoint or in Maspeth, DOT bike and greenways official Craig Baerwald told the Queens Community Board 2 Transportation Committee Monday night. 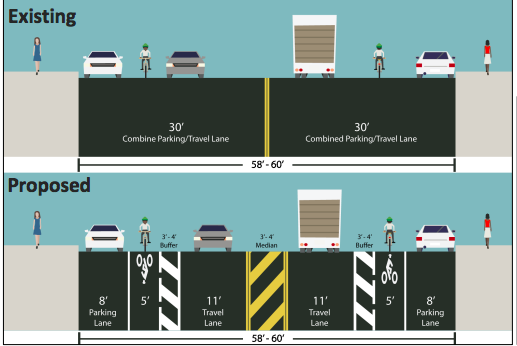 “We’re having ongoing conversations with the state to provide them with the safest, most seamless connection to the bike facility,” said Baerwald, who felt compelled to tell members that no parking spaces or roadway capacity would be lost. In Brooklyn, the bridge’s bike and pedestrian path will follow the alignment of the exit ramp to Meeker and Morgan Avenues and touch down at the corner of Meeker Avenue and Van Dam Street. 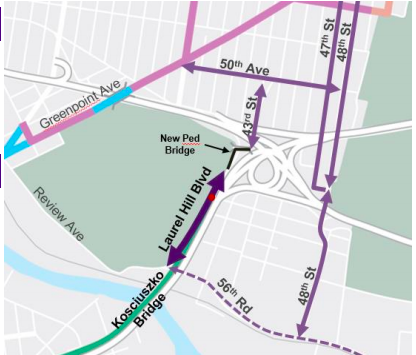 In Queens, the path will diverge from the highway alignment and touch down at the corner of Laurel Hill Boulevard and 54th Road, according to state transportation officials. The city also unveiled on Monday night its own in-the-works plans for the connections. DOT is proposing turning the current staging area for construction between 54th Avenue and 56th Road into a shared-use path that connects to the new pedestrian bridge, and creating another shared use sidewalk that connects to the pedestrian bridge at the intersection of 43rd Street, the pedestrian bridge, and the Queens Midtown Expressway. On 48th Street between 56th Road and 47th Street, cyclists would get a little more protection with a painted three-to-four-foot buffer separating them from moving cars. 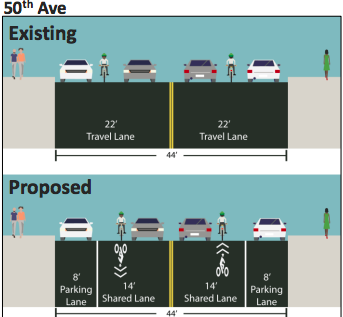 On 48th St between 47th Avenue and 47th Street, and 47th Street between 48th Street and Greenpoint Avenue, the city pans to install standard painted bike lanes. 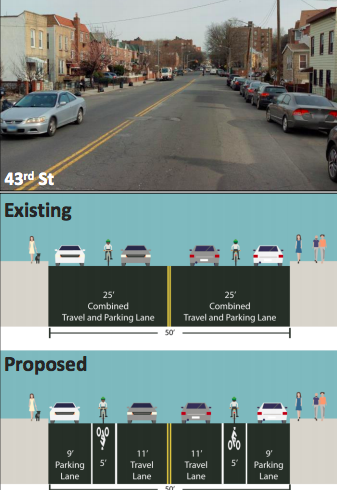 Cyclists would again be forced to share the road with cars on 48th Street between Queens Boulevard and 47th Avenue. 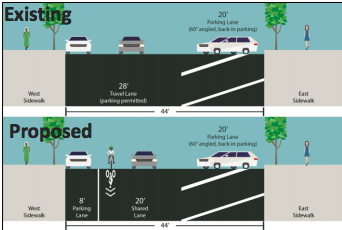 And on 47th St under the Long Island Expressway, the city would install jersey barriers for a curbside protected bike lane. But the city is still working on a plan for 56th Rd and Rust Street to the bridge — which is a heavy truck route in a more industrialized area, said Baerwald. DOT expects to present plans to the full board in June, but doesn’t yet have a timeline for implementation. The painted lanes with buffers are just about the exact size necessary for a UPS driver to safely get out of their truck without stepping into moving traffic. Great work DOT. In Greenpoint, the bridge’s new shared bike and pedestrian path will follow the highway's alignment of the exit ramp to Meeker and Morgan Avenues.